034Motorsport is pleased to present a new performance dogbone mount (torque arm bushing) insert upgrade for the MkVII Volkswagen Golf/GTI/R, 8V Audi A3/S3/RS3 & MkIII Audi TT/TTS/TTRS! This mount was thoroughly tested by 034Motorsport and independent Audi/Volkswagen enthusiasts before release on new MQB chassis vehicles. Installation is very simple, can be performed in minutes, and is completely reversible. Please Note: Some Mk7 GTI & Golf R models are equipped with a different factory dogbone mount. 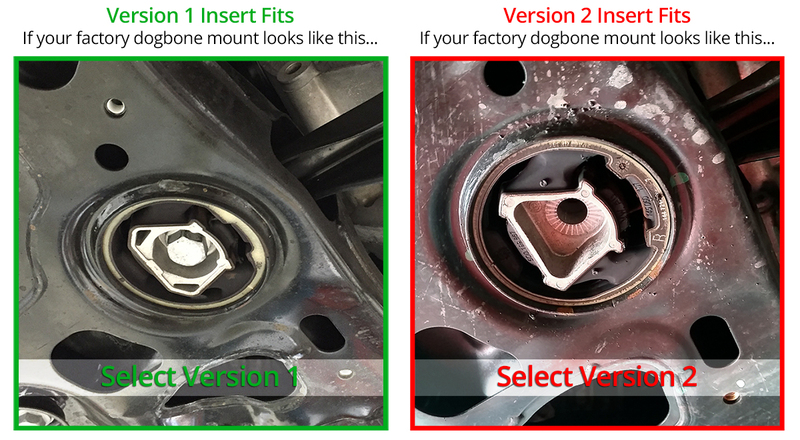 To ensure fitment on your vehicle, please visually verify the mount you have using this guide, then select the Version 1 or Version 2 insert before adding the item to your cart.